This is the first outfit post that I have done in months. I think Matt and I are a little rusty! I practically forgot how to use our camera so a few of the pictures are a little blurry. And we had like 5 minutes to take these before Lincoln needed to be fed. Things have definitely changed and I am still just trying to figure it all out. But it feels good to be back to posting again! I wore this outfit over the weekend. I was so bummed when I saw that this shirt was already sold out because I love it so much. But I did find a few similar options that I also love. And these jeans are on sale for $32! You can not beat that! They are such a steal. Such a cute top, very girly and perfect for Summer! 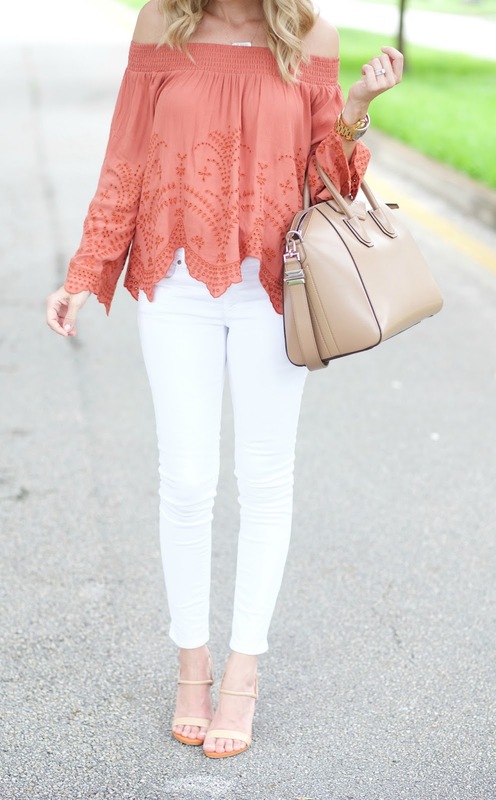 You're looking wonderful in this casual combo! Love your outfit! The bright orange top is perfect! Jade, What camera do you use? Love the orange paired against the white. I love all off the shoulder tops/dresses right now! I wish this one wasn't sold out, the color is amazing! Love love love that top!! Such a pretty color on you--and those shoes are too cute! Orange dress is more elegant style in color when it comes to girls dresses because it belongs to the unique style of fashion and it comes with a stylish performances of dress that is very fashionable.